We are a leading Wholesale Trader of lokfix s grout, conbextra ep10m epoxy resin grouting, conbextra gp2 (25kg) grout and lokfix p grout from Nagpur, India. Uses Lokfix are used for high strength corrosion resistant anchoring of bolts and bars from 12 - 51mm diameter into concrete, rock, masonry or brickwork where high speed of installation and early application of load is required. Permanent installation of reinforcement starter bars, foundation bolts, base plates, balustrading, barriers and safety fences, railway tracks, tie-back anchors, reinforcement dowelling abutments, ground anchors for towers, cranes, dock sills. 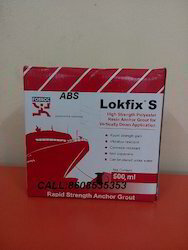 Advantages „ Rapid strength gain „ Vibration resistant „ Corrosion resistant „ Non expansive „ Can be placed under water Standards and specifications Materials tested in accordance with BS 4551 BS5080 BS2782 Description The three versions of Lokfix polyester resin grout are all premeasured, two part, filled polyster resin grouts. After hardening the grout produces anchorages of consistent reproducible values. The versions are : Lokfix L ( Large aggregate) Lokfix S ( Small aggregate) Lokfix P ( Pumpable grade) Lokfix L is used where hole diameter exceeds bar diameter by 25 to 50mm. Lokfix S is used where the difference between the hole diameter and bar diameter is < 25mm. 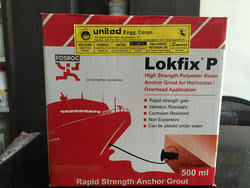 Lokfix P is used in overhead or horizontal holes where bar / hole relationship conforms to Lokfix polyester resin grout S. The thixotropic nature of Lokfix polyester resin grout P reduces flow of grout out of the hole. Uses Conbextra EP10(M) is a two part epoxy resin system for grouting gaps ranging from 0.25mm to 9mm. It is an all liquid system consisting of a base and hardener. 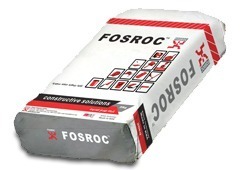 Advantages  Moisture insensitive  Low creep characteristics  High compressive, tensile and flexural strengths  Fast, convenient pumping with early strength gain  Withstands a wide range of chemicals Technical support Fosroc offers a comprehensive range of high performance, high quality concrete repair and construction products. In addition, Fosroc offers technical support service to specifiers, end-users and contractors, as well as on-site technical assistance in locations all over the country. Properties The following results are typical for the hardener grout at 30 deg.C. Test method Typical result Density (Kg/m3) 1060 Compressive strength ( N/mm2 ) ASTM D695 60 Tensile strength (N/mm2) ASTM C307 - 94 20 Flexural strength (N/mm2) BS6319 Part 4 45. 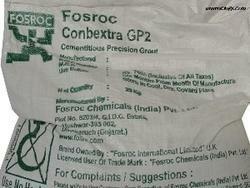 Conbextra GP2 is supplied as a ready to use dry powder. The addition of a controlled amount of clean water produces a free flowing, non-shrink grout for gap thicknesses up to 100mm. Conbextra GP2 is a blend of Portland cement, graded fillers and chemical additives which impart controlled expansion in the plastic state whilst minimising water demand. The low water demand ensures high early strength. The graded fi llers are designed to assist uniform mixing and produce a consistent grout. Free flow ensures high level of contact with load bearing area. Lokfix S25 : Pourable grade, 25 minute gel time at 20°C for use in vertical down holes where the hole is 8 to 40 mm greater in diameter than the bar. Lokfix P25 : Thixotropic grade, 25 minute gel at 20°C for use in overhead or horizontal holes where the hole is up to 25 mm greater in diameter than the bar. The thixotropic nature of Lokfix P25 reduces flow of grout out of the hole. Looking for Grout & Anchors ?